Born in the northern mill town of Burnley, in Lancashire, England, Ian McKellen was the son of a civil engineer. Encouraged by his parents to take an interest in theater, he developed an early fascination with the stage. After his family moved to the mining town of Wigan, McKellen began acting in school plays. At 13, he performed in his first Shakespeare play playing Malvolio in Twelfth Night. During his summer vacations he gained an additional appreciation for Shakespeare when he attended camp in Stratford-upon-Avon and spent the evenings watching the likes of Laurence Olivier, Vivien Leigh, and John Gielgud. When McKellen went to Cambridge University, he was offered a place to study English at Saint Catherine's College. This offer was withdrawn two years later, when McKellen's involvement in theater almost completely took precedence over his studies. His work in student theater proved invaluable, however, allowing him to work with future cohorts, Derek Jacobi, David Frost, and Trevor Nunn. After leaving Cambridge in 1961, McKellen began his professional career at Coventry's Belgrave Theatre, where he acted in a production of A Man for All Seasons. Three years later, he was living in London and working steadily on the stage. He acted in countless productions, a number of which he also directed, and co-founded the progressive Actors' Company in 1972. He earned a score of awards and honors for his work and in 1979 was made a Commander of the British Empire. Two years later, he won international theatrical acclaim with his Tony Award-winning portrayal of Salieri in the Broadway production of Amadeus. It wasn't until 1969 that McKellen made his film debut with a small role in The Promise , the same year that he caused a sensation on the stage with his portrayal of Edward II, which required him to kiss another man. 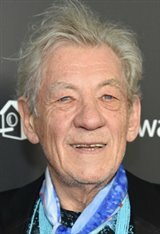 McKellen, an admitted homosexual, later explained that the theater introduced him to other gay men, which eased his acceptance of his own sexuality. He became a vocal activist, and one of a handful of openly gay knights when he was knighted by Queen Elizabeth in 1989. In 1993, he became recognizable to American television audiences playing gay men in And the Band Played On and Armistead Maupin's Tales of the City, two acclaimed TV miniseries; McKellen earned an Emmy nomination for his work in the former. Three years later, McKellen earned another Emmy nomination for his supporting role in Rasputin. In That same year, he gained more visibility on the big screen appearing in Six Degrees of Separation and The Ballad of Little Jo. He continued to turn in strong performances in such films as Cold Comfort Form (1995) and Jack and Sarah (1995), and he earned particular acclaim for his titular performance in Richard Loncraine's 1996 Richard III, for which he also adapted the screenplay. In the final few years of the millennium, McKellen has shown strong performances in Bent (1997), Apt Pupil (1998), Gods and Monsters (1998), giving a stunning portrayal of James Whale during the director's last days. His performance won a score of international accolades, including Best Actor Oscar and Golden Globe nominations and Best Actor honors from the National Board of Review. At the beginning of the 21st century, he completed a number of films including the sci-fi/fantasy X-Men (and its sequel), playing the mutant team's arch-enemy, Magneto. He also worked on The Lord of the Rings trilogy, in which he played the Hobbits' friend and magical advisor, Gandalf, the grey wizard. His performance as the wizard earned him his second Oscar nomination for Best Supporting Actor. He also shared a 2004 Screen Actors Guild award with the rest of the cast for Outstanding Performance by a Cast in a Motion Picture. In 2003 he won an Entertainment Personality Award at the British Independent Films Awards, and in 2005, he was nominated for a Genie Award for his work in Emile . He continues to win top roles in major blockbusters, including playing Sir Leigh Teabring in The Da Vinci Code and reprising his role as Magneto in X-Men: The Last Stand (both 2006). In 2012, he reprised his role as Gandalf for The Hobbit: An Unexpected Journey , the first installment of a prequel trilogy to The Lord of the Rings series. He also appeared in the next two films: The Hobbit: The Desolation of Smaug (2013) and The Hobbit: The Battle of the Five Armies (2014). Ian's latest film credit is the live-action adaptation Beauty and the Beast (2017) with Emma Watson, in which he plays Cogsworth. He also recently took to the stage again to play the title role in the National Theatre production of King Lear (2018), which was broadcast live in cinemas. In December 2012, McKellen revealed he has had prostate cancer for several years, but because it isn't spreading he does not yet need treatment.